TV Lesson an all-encompassing library of “how-to” content online, lesson content covers most conceivable topics though I was obviously drawn to the sports lessons. These seem to be dominated by golf and dance at the moment but that could change as the site allows users to upload content. Whilst this is great you may want to take some of the lessons with a pinch of salt from the self professed experts but there are some real gems as well. The technology lessons also look like they may be a useful source of information and learning. The simplest and quickest podcasting tool ever? And its Free!! Here is something for anyone who wants to create an audio file and publish it online easily and quickly. 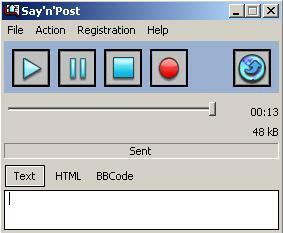 Say and Post is so simple to use even I managed and I have never podcast anything before listen to my dulcet tones. To create all you have to do is download the software record your clip and upload it to the Say and Post server all done via the simple interface below. You are provided with a link to the audio file to copy and paste in your blog or website and thats it. Easy or what? I attended this conference at the end of October and it was thoroughly enjoyable and informative. The workshop summaries and PowerPoint’s are available online here. There should also be podcasts of the main presentations and panel discussions to follow. I spent a really enjoyable morning working with the PE students from the Stirling University. I was invited along by Will Kay and Suzanne Hargreaves to enhance the students understanding of Dartfish which the department has recently purchased. Will and Suzanne are keen for the students to use the software within their studies and to enhance their teaching whilst on placement. I also showed the students a few other gems like the LTS PE website and this blog where I promised to post some links and a simple Dartfish user guide for them. We started off with a presentation then moved in to the Gameshall for some practical hands on experience. See the photos below. In the Gameshall the Students had to design a simple gymnastic routine and capture it and analyse it with the dartfish software. The video clip below was captured and edited with dartfish (though titles and audio were incorporated via moviemaker). The video shows a group sequence then individual students comparing themselves to the model performer. The video also highlights a few from the vast array of tools that can enhance the analysis such as text input, tracing the path of an object (feet in this instance), the clone tool to extract one part of the video and lay it on another and the time clock. You will also notice that we are able to compare 4 videos at once. The students really seemed to enjoy it and felt Dartfish is a tool that could enhance their teaching, some even improved their own performance as a direct result of using the software which really brought home to them the power of this resource. However the biggest cheer of the day was when I asked them if I could use some of the videos from the day to put something together for YouTube so I could share it easier via the blog. I should not have been surprised by this as I would imagine many already had uploaded clips to YouTube or various other video sharing sites. This may also be an indication of how comfortable the next generation of teachers will be with using social media and web 2.0 (or whatever we are calling it now). That however is a post for another day. What came through from the day for me was the students enthusiasm and willingness to embrace the technology. I wish I had more time to show them the vast array of other resources that are available for using within their teaching. Another day perhaps.